Since 1990, Coastal Development & Realty has been a full-service real estate office specializing in North Carolina Real Estate, particularly Brunswick County and Holden Beach Real Estate. Whether buying or selling a home or coastal property, Coastal Development and Realty’s solid commitment to your complete customer satisfaction is unparalleled. We’re always eager to put our combined knowledge of Holden Beach Real Estate and our experience to work for every client we serve. Our success in buying and selling North Carolina Real Estate is a result of solid commitment to honesty, communication, and complete customer satisfaction. At Coastal Development & Realty, we sell coastal homes, vacation home properties, lots, land, and commercial properties. But we also focus on the people who comprise our communities, from Holden Beach, to Sunset Beach. We listen, ask questions, and find out how we can assist each client – whether buying or selling because our number one priority is to make the process as efficient and effortless as possible. For buyers, we focus on finding the perfect piece of Brunswick County real estate for you in a community reflective of your lifestyle. We also assist our sellers with pricing your home competitively and matching you with the right buyer. Our marketing efforts are based on decades of experience and no one knows the local real estate market as thoroughly as we do. Our clients receive personalized, superior service…our reputation is based on the fulfillment of that promise. 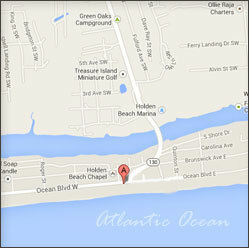 To talk to our Holden Beach real estate specialists today, contact us!